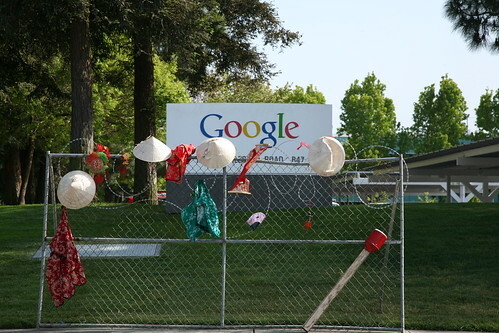 monochrom and The Billboard Liberation Front recently joined forces up to create “The Great Firewall of China” at the Google headquarters in Mountain View as part of monochrom’s Sculpture Mobs project. Boing Boing TV was there with the full report. Here’s the press release and photos from the installation. Coincidently, the action took place the same day as Google’s annual shareholders meeting and a news crew from the local ABC affiliate (KGO Channel 7) happened by as the Sculpture Mobs installation was in progress, including it in their report, referring to monochrom and BLF as human rights activists.